Lance has been working his way towards greater and greater mobility. 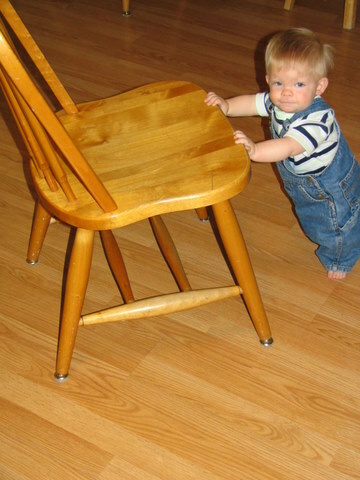 First he figured out that some things can be pushed around – like chairs across a floor, or a stroller across the carpet. Of course, they only go so far before he runs into something and the ride is over. Sometime last week Brian decided it was time for walking lessons and to our amazement, Lance took a few steps between us! It was a little scary for him but the more we practiced the better he liked it and now laughs as he goes between us. Here he is with his Aunt Katie and Uncle “Dude”, showing off his new skill. Then we took this video last night – he is really getting good! Watch out world, here I come!!! !